Cerasus virginica Michx. ex hort. Prunus valida (Wooton & Standl.) Rydb. Prunus arguta Bigel. ex M. Roem. Prunus virginiana, commonly called bitter-berry, chokecherry, Virginia bird cherry and western chokecherry (also black chokecherry for P. virginiana var. demissa), is a species of bird cherry (Prunus subgenus Padus) native to North America; the natural historic range of P. virginiana includes most of Canada (including Northwest Territories but excluding Yukon, Nunavut, and Labrador), most of the United States (including Alaska but excluding some states in the Southeast) and northern Mexico (Sonora, Chihuahua, Baja California, Durango, Zacatecas, Coahuila and Nuevo León). Chokecherry is a suckering shrub or small tree growing to 1–6 m (3 ft 3 in–19 ft 8 in) tall, rarely to 10 m (32 ft 10 in). The leaves are oval, 2.5–9 cm (1–3 1⁄2 in) long and 1.2–5 cm (1⁄2–2 in) wide, with a serrated margin. The flowers are produced in racemes 4–11 cm (1 1⁄2–4 1⁄4 in) long in late spring (well after leaf emergence). They are 1⁄3–1⁄2 in (8–13 mm) across. They produce a strong heady aroma which some people find to be unpleasantly smelly, while others perceive them to have an aphrodisiac like effect. The fruits are about 6–14 mm (1⁄4–9⁄16 in) in diameter, range in color from bright red to black, and possess a very astringent taste, being both somewhat sour and somewhat bitter. When very ripe, the "berries" (actually drupes) are dark in color and less astringent and sweeter than when red and unripe. Chokecherries are very high in antioxidant pigment compounds, such as anthocyanins. They share this property with chokeberries, further contributing to confusion. Prunus virginiana var. melanocarpa (A.Nelson) Sarg. The wild chokecherry is often considered a pest, as it is a host for the tent caterpillar, a threat to other fruit plants. However, there are more appreciated cultivars of the chokecherry. 'Canada Red' or 'Schubert' has leaves that mature to purple and turn orange and red in the autumn. 'Goertz' has a nonastringent, and therefore palatable, fruit. Research at the University of Saskatchewan seeks to find and create new cultivars to increase production and processing. The chokecherry is closely related to the black cherry (Prunus serotina) of eastern North America; it is most readily distinguished from that by its smaller size (black cherry trees can reach 100 feet tall), smaller leaves, and sometimes red ripe fruit. The chokecherry leaf has a finely serrated margin and is dark green above with a paler underside, while the black cherry leaf has numerous blunt edges along its margin and is dark green and smooth. The name chokecherry is also used for the related Manchurian cherry or Amur chokecherry (Prunus maackii). For many Native American tribes of the Northern Rockies, Northern Plains, and boreal forest region of Canada and the United States, chokecherries were the most important fruit in their diets and were added to pemmican, a staple. The bark of chokecherry root was once made into an asperous-textured concoction used to ward off or treat colds, fever and stomach maladies by Native Americans. The inner bark of the chokecherry, as well as red osier dogwood, or alder, was also used by natives in their smoking mixtures, known as kinnikinnick, to improve the taste of the bearberry leaf. The chokecherry fruit can be used to make jam or syrup, but the bitter nature of the fruit requires sugar to sweeten the preserves. Chokecherry is toxic to horses, moose, cattle, goats, deer, and other animals with segmented stomachs (rumens), especially after the leaves have wilted (such as after a frost or after branches have been broken) because wilting releases cyanide and makes the plant sweet. About 10–20 lbs of foliage can be fatal. Symptoms of a horse that has been poisoned include heavy breathing, agitation, and weakness. The leaves of the chokecherry serve as food for caterpillars of various Lepidoptera. See List of Lepidoptera which feed on Prunus. In 2007, Governor John Hoeven signed a bill naming the chokecherry the official fruit of the state of North Dakota, in part because its remains have been found at more archeological sites in the Dakotas than anywhere else. Chokecherry is also used to craft wine in the western United States mainly in the Dakotas and Utah as well as in Manitoba, Canada. ^ Rehder, A. (1977) . Manual of cultivated trees and shrubs hardy in North America exclusive of the subtropical and warmer temperate regions. New York: Macmillan. ^ a b c d e "Prunus virginiana". Germplasm Resources Information Network (GRIN). Agricultural Research Service (ARS), United States Department of Agriculture (USDA). Retrieved February 28, 2013. ^ "Prunus virginiana". 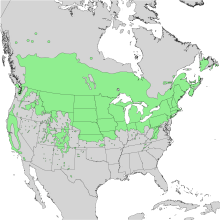 State-level distribution map from the North American Plant Atlas (NAPA). Biota of North America Program (BONAP). 2014. ^ "Prunus virginiana: photos, partial distribution map". SEINet, Arizona–New Mexico chapter. ^ a b c d e Rohrer, Joseph R. (2014). "Prunus virginiana". In Flora of North America Editorial Committee (ed.). Flora of North America North of Mexico (FNA). 9. New York and Oxford – via eFloras.org, Missouri Botanical Garden, St. Louis, MO & Harvard University Herbaria, Cambridge, MA. ^ Hilty, John (2016). "Chokecherry (Prunus virginiana)". Illinois Wildflowers. ^ Chayka, Katy; Dziuk, Peter (2016). "Prunus virginiana (Chokecherry)". Minnesota Wildflowers. ^ Farrar, J.L. (1995). Trees in Canada. Markham, Ontario: Fitzhenry & Whiteside. ^ Elias, Thomas S.; Dykeman, Peter A. (1990). Edible Wild Plants A North American Field Guide. New York: Sterling Publishing. ISBN 0-8069-7488-5. ^ Smith, Norman F. (2002). Trees of Michigan and the Upper Great Lakes (6th ed.). Thunder Bay Press. p. 81. ^ "Bearberry". Discovering Lewis and Clark. The Lewis and Clark Fort Mandan Foundation. 2009. ^ Gibbons, Euell (1962). Stalking the Wild Asparagus. New York: David McKay. ^ Kindscher, K. (1987). Edible Wild Plants of the Prairie: An Ethnobotanical Guide. Wikimedia Commons has media related to Prunus virginiana. This page was last edited on 18 October 2018, at 00:37 (UTC).